One of my favorite movies of 2015 was a film called Sicario. It took an interesting look at the moral ambiguities that are a part of controlling the actions of the Mexican cartels on the American side of the border. It was a perfectly paced and beautifully shot film. As excellent as director Denis Villeneuve did on that film, the writer was the star of the show, and that writer was Taylor Sheridan, an actor who decided to try his hand at screenwriting. It payed off wonderfully, and now we have his sophomore effort titled Hell or High Water. 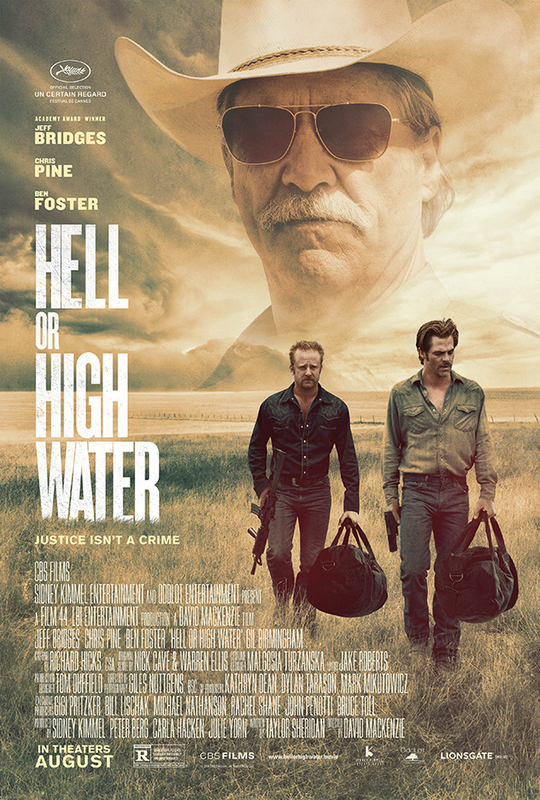 I’ve seen a lot of really good movies this year, but none of them have reached the heights in terms of film making and storytelling that is seen in Hell or High Water. 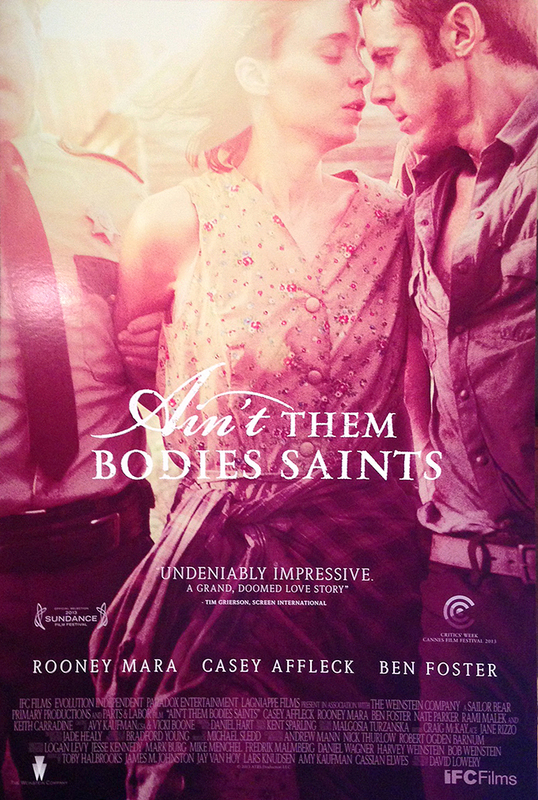 As of right now, I have to say that this may be one of, if not the best movie of the year. Toby (Chris Pine) and Tanner (Ben Foster) are two brothers who are desperate to stop their family farm from being foreclosed. Their last resort is to begin a chain of bank robberies to raise money to pay off the loan that was unfairly designated by the banks. Of course, this is a very illegal solution, and therefore catches the attention of Texas Ranger Marcus Hamilton (Jeff Bridges), a tough as nails officer who wants one last successful case before he packs everything in and retires. What Hamilton doesn’t understand about these two brothers is just how desperate they are to save the one thing their family has to care for and make money with. This begins a chase through many different towns to find justice, but the question remains if the brothers are the ones to suffer the long arm of the law. This film is directed by a guy named David Mackenzie, and I have to admit that I’ve never seen another one of his movies so I have no basis to really judge him or the rest of his work. I will say, if it’s anything like Hell or High Water, I’d love to check it out. This is a beautiful looking film, and it’s clear that Mackenzie went in with a very clear vision of how this movie should look. From the very first scene I was hooked by the expressive camera movement and the way it helped tell the story. Credit also has to be given to cinematographer Giles Nuttgens for the work he did with Mackenzie to make this film look so beautiful. There are scenes on southern highways with fields that are on fire or being completely destroyed in the search of oil, and with Mackenzie’s and Nuttgens’ talents it is made to look like a portrait of a dystopian America. Add Nick Cave’s and Warren Ellis’ creeping score to all this and you’ve got yourself something really special. One of the first things that intrigued me about this movie was the cast. It’s hard to choose just one protagonist, but the one that really sticks out as the main character is Toby, played by Chris Pine. I really only know Chris Pine as Captain Kirk in the rebooted Star Trek movies, so I didn’t have too high expectations for him. That being said I was surprised by his performance and confidence in his character. It’s a more subtle performance than everyone else’s, but it’s just what the movie and the character needed to really work. I have a firm belief that Ben Foster is one of the most underrated actors working today. Every movie I’ve seen him in, even if I didn’t like the movie, I could never say anything bad about Foster. He brings his A-game once again in Hell or High Water, and it didn’t take long for him to become my favorite character in the movie. Finally, Jeff Bridges brings a lot of depth to the character of Marcus Hamilton. He’s a confident but melancholy character who hides behind insults and racism when that confidence falters. All of these character complexities and idiosyncrasies are brought out by the fine actors, but if it wasn’t for the writer, this movie wouldn’t be what it is. That’s what brings us to the real star of the show, and that person is Taylor Sheridan. Like I said before, I loved his screenplay for Sicario and Hell or High Water is a perfect way to follow up the success of his first film. On the surface, this film works as a great neo-western filled with excellent characters and a screenplay that is paced very well. It’s not so slow that it gets boring but it’s not so fast that you don’t have any time to think. There’s so much more going on beneath the surface than a tale of bank robberies in small Texas towns. 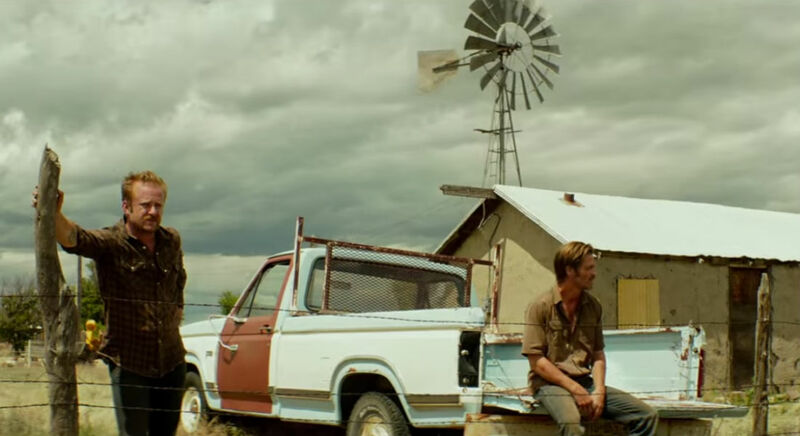 Like Sicario, Hell or High Water uses this story as a cautionary tale about racism, poverty, corrupt banks, big business, and even more abstract ideas like self worth and family. There’s so much to be discussed after seeing this movie that it would be impossible just to talk about the story and not about the different themes and motifs that shine throughout the film. I can’t wait to see more from Sheridan. I’ve seen a lot of great movies this year, and at first I thought The Jungle Book was going to stay in the number one spot for my favorite movie of 2016. Now we have a new champion. Hell or High Water is without a doubt the best movie I’ve seen all year so far. The characters are rich, the actors are completely in touch with their roles, the film is just beautiful to look at, and Sheridan’s screenplay is going to have to be a contender for Best Screenplay come Oscar season. This is a movie about an era, a place, and people desperate to survive. If you only see one movie this year, make it Hell or High Water. In 2008, an Icelandic film was released titled Reykjavik-Rotterdam and it became something of an international hit in some circles. It was one of the most expensive Icelandic films when it was made and received plenty of awards in its home country. As America likes to do with foreign hits, we made a version of our own in 2012 and called it Contraband. What made this remake unique was that it was directed by Baltasar Kormákur, who starred in the original 2008 film. While this is an interesting directing choice and the cast has a couple of my favorite actors, the end result is nothing too memorable at all, or at least memorable for the wrong reasons. Chris Farraday (Mark Wahlberg) was one of the most brilliant smugglers to ever work in the business, but has long since left his life of crime to settle down with his wife, Kate (Kate Beckinsale), and their two kids. While Farrady is content with living a quiet life, her brother Andy (Caleb Landry Jones) is not, and soon gets mixed up with a dangerous criminal named Tim Briggs (Giovanni Ribisi). Briggs is after Andy for $700,000 after he screwed up a job, and is even going so far as to threaten Chris and the rest of his family. This forces Chris to go back to his old ways for one last job to pay back Briggs. With a little help from his best friend Sebastian (Ben Foster), Farraday heads to Panama to bring back $10 million in fake bills, but what Farraday fails to realize is that there is a higher power than Briggs pulling the strings. So the first thing I have to say about this movie is that it isn’t very original, and that’s ok. I didn’t really go into Contraband expecting it to break new ground or anything. All I wanted was to be entertained for a couple of hours. That being said, this is a pretty entertaining movie with a great deal of suspense and some cool action sequences. But honestly, it isn’t really enough to keep it all afloat. One of my more minor complaints is part of the cast. Giovanni Ribisi and Ben Foster completely own their roles and reminded me why they are two of my favorite actors. Unfortunately, Wahlberg doesn’t really have much of a personality and all and delivers a lot of his lines with the same awkward enthusiasm that he did in The Happening. As for the rest of the cast like Kate Beckinsale, Caleb Landry Jones, Lukas Haas, and even J.K. Simmons, well, they just didn’t really have too much to do. I’m not sure if the intended goal of Contraband was for it to be an action movie or a heist movie, because it sort of does both, but not entirely too well. There’s not enough action for this to be called an action movie and there isn’t enough planning or fake outs for this to be a heist movie. Instead it’s this weird mash up of cliches from both genres. There’s one real all out action scene and it hardly even fits into the movie. In fact, the whole middle part where Farraday gets mixed up with some random Panamanian gangster really didn’t need to be in the movie at all, which brings me to my main beef with this mess of a movie. This movie goes all sorts of places that it has no business going to. For a while the plot goes on pretty normally, and I was into it, but then it redefined the term “whatever can go wrong, will go wrong.” There are far too many plot twists and contrivances that get in the way of a narrative that had all the opportunity in the world to go smoothly and painlessly for close to two hours. Instead I ended up watching a movie that is packed to the brim with stupid twists all for the sake of shocking the audience, instead of being put in to try and tell a good story. The major twist was pretty cool, but all of the other minor ones just frustrated me and made the movie feel completely broken into pieces. Contraband tries really hard to be a highly intelligent, complex heist thriller that turns out to be nothing more than convoluted and overdone. 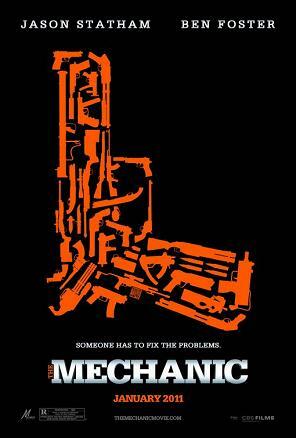 The only real redeeming qualities this movie has are the performances given by Giovanni Ribisi and Ben Foster. They can really do a lot with shoddy material. Contraband is an unoriginal mess that isn’t really an awful movie, but it’s hardly one I can recommend to anybody. Throughout my movie watching career, there have been collaborations between certain actors and film makers that work so well it should be illegal. For the sake of this review, the collaboration is between writer/director Oren Moverman and his go to actor Woody Harrelson. 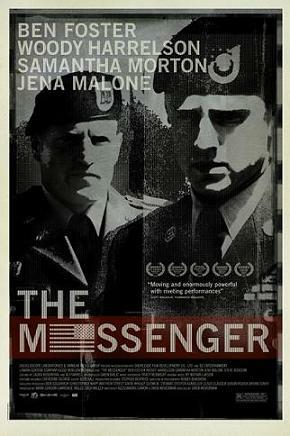 In 2010, Harrelson was nominated for an Academy Award for his performance in Moverman’s heart wrenching drama, The Messenger. The two were then reunited 2012, along with co-writer James Ellroy (best known for L.A. Confidential), with Rampart. The performances and overall story in this film are really something to behold, but the overcrowding of subplots and an over the top artsy fartsy style almost ruined the movie for me. The year is 1999 and Dave Brown (Woody Harrelson) is a police officer in the Rampart Division of the LAPD. Unfortunately for the people of Los Angeles, Brown is a racist, homophobic, and generally intolerant bigot who will resort to violence whenever he wants to to get the information he wants. After he is caught almost beating a suspect to death on tape, Officer Dave Brown’s life soon starts spiraling out of control. His ex-wives who are also sisters (Anne Heche and Cynthia Nixon) want nothing more to do with him while Assistant District Attorney Joan Confrey (Sigourney Weaver) starts pushing him towards an early retirement. As if that wasn’t enough, Brown becomes embroiled in an affair with an attorney working against him named Linda (Robin Wright) but also gets into more trouble after getting bad advice from his mentor, Hartshorn (Ned Beatty), which ends in a brutal murder. I think the main reason to see Rampart is to see all of the amazing talent at work. Harrelson gives what may be the best performance of the year. It probably even beats his work on True Detective, especially since there is so much more corruption and hostility flowing through his character’s veins. A lot of the other actors I feel get under utilized though. For example, Steve Buscemi is only in one scene and I wanted to see him a lot more. Ice Cube also only shows up towards the end even though his character had a lot of great potential. After Harrelson, I think the next performance you really have to pay attention to is Ben Foster’s. Foster is one of Hollywood’s most underrated actors and his small role in Rampart and his leading role in The Messenger proves he’s capable of a lot more than he is given. James Ellroy is a master at writing in the crime genre. He has written plenty of murder mysteries and dramas while also penning screenplays and having involvement in documentaries. That being said, both Ellroy and Moverman went a little overboard in Rampart. The story of a corrupt cop finally facing his demons and getting what he has coming to him is great, and they show his breakdown wonderfully. The problem is that there is way too much crammed into this movie. It’s like they tried to take everything from a long novel and stuff it into a movie that’s less than two hours. Characters are underused, plot lines are unresolved, and some of the development feels either forced or nonexistent. Luckily, the crux of the story is there and really good. This is more of a character study of Dave Brown and Ellroy and Moverman hit the nail on the head when it came to that area of the screenplay. Another major complain that I have with Rampart is that Moverman and cinematographer Bobby Bukowski went a little overboard with the art design. There’s a motif throughout the film that Dave Brown slowly begins disappearing. The start of the movie has him at the forefront of the action going on onscreen and while the movie goes on, he becomes framed behind objects and obscured. That’s an example of great artistic design. On the flip side, there’s a scene where the camera keeps cutting and spinning during a meeting and it’s not only unnecessary, but looks stupid. I get what they were trying to do, but it just didn’t work and only succeeded at annoying me. If Moverman and Bukowsky just toned it down a little bit, the film would have been all the better for it. I almost loved Rampart and at the same time I almost hated it. I really don’t know how else to explain how I feel about this movie. On one hand it tells a really complex story about a man who refuses to change who he is and has to suffer for it, and on the other hand it’s an overstuffed movie that seemed to be going nowhere at parts. I feel equal on these two sentiments, so Rampart really just left me baffled. I wanna say give it a watch, but I can’t see anyone really coming out of it without a lot of questions that need answering.